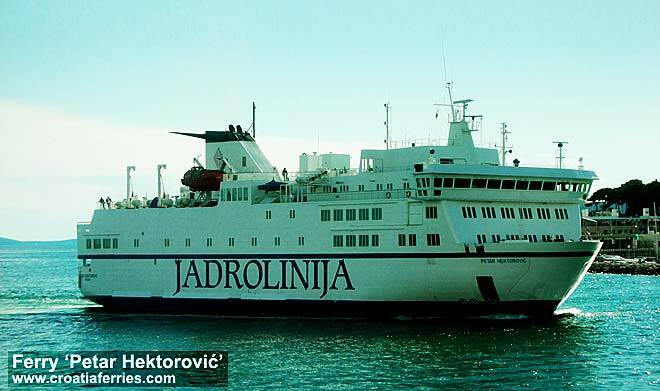 A roll-on/roll-off (RORO) car and foot passenger ferry ‘Petar Hektorović’ is owned by Jadrolinija from Rijeka. Built in Denmark in 1989, the ferry is just under 92 meters long and 18 meters wide with speed of 15.5 knots. It has a capacity of 1080 passengers and 120 cars. There are also two restaurants and bars on the ferry as well as a small shop. The ferry is named after 15th century Hvar Island’s poet and collector of Dalmatian songs Petar Hektorović whose poem titled ‘Ribanje i ribarsko prigovaranje’ aka ‘Fishing and Fishermen’s Talk’ is a well known Croatian philosophic narrative work. This lovely, chubby ferry is currently serving Jadrolinija‘s ferry route 602, connecting ferry port Split with Vis on Vis island. Note – RoRo (Roll-on/roll-off ) type of ferries are vessels where vehicles load via the front and back of the ferry opening hull which makes is pretty easy for vehicles to embark and disembark.